From the Vineyards to Barcelona-Wine Tasting with the Winemaker! You must be a member of the Barcelona Wine & Spirits Group to attend this activity. Would you like to join this group? Let's get beyond the bottle of wine and meet the person, the family and her story itself. Let's shake the hand that makes the wine we will enjoy on our tasting! 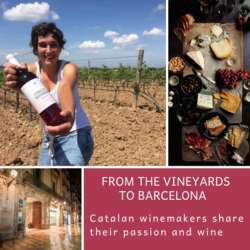 It's a particular privilege of Barcelona which is surrounded by vineyards and wine cellars to give us the genuine oportunity to reach out to the core of the Catalán wine and meet the winemakers in person. This special night at the very first Protected content tasting at theProtected content Protected content and especially we will meet Eva Bonet Baqué - the wine family member, who'll share her passion with us and present the pearls of the cellar like e.g. Reserva from Protected content well as the newest gems not botlled nor to be found on the market yet. All this acompanied by the savory cheeses and gourmet apetizer selection provided by the four-star Hotel kitchen will make the evening exeptional and just perfect. Due to the limited places a previous reservation on Protected content The payment will be made at the doors, no card payment will be possible. Let's take delight of the authentic passion for wine together!